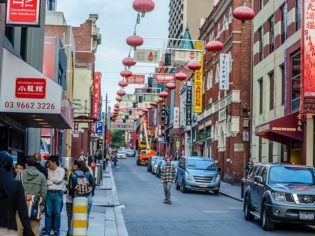 Terror suspect Mark Dapin walks though Melbourne’s Chinatown in the footsteps of Mao and Deng (who’ve never been there). I arrive at my Melbourne hotel at 10.15pm to find the only drinks in my mini-bar are two bottles of spring water and two cans of Smirnoff Ice. The bar is closed, so I stride out into Little Bourke Street in search of a beer. As I walk through the door of the nearest pub, the Exford Hotel in Chinatown, I notice everyone at the bar is looking in the same direction. I guess there must be two girls having a catfight, or an AFL game (which is much the same thing) on Sky Channel, but I’ve stumbled upon Com-ed-oke, an open-mike night for “professional comedians” to raise money for the Royal Children’s Hospital. Great, I think, I’ll steal the best jokes. Unfortunately, there are no best jokes. All the comedians adopt a similar persona – a deadpan thick bloke who has no luck with sheilas and swears a lot – and aren’t as funny as the average deadpan thick bloke who has no luck with sheilas and swears a lot. That’s probably the best joke, actually. I’ve always been interested in Chinese-Australian history. That’s not strictly true. In fact, I’ve never given it a second thought. I have, however, always enjoyed Chinatowns. The cheap food, the neon lights, and the garbage that smells of fermented fish in rotten cabbage always remind me of happy days backpacking in Hong Kong. 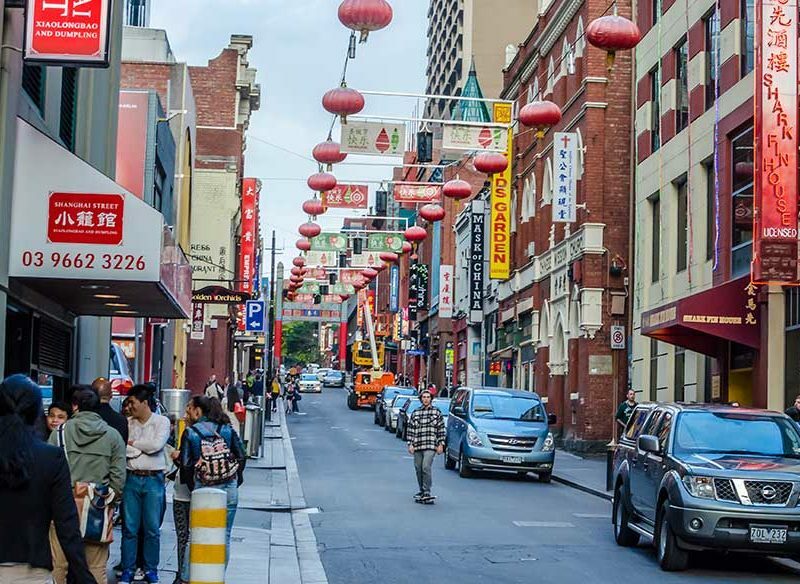 Melbourne’s Chinatown is the oldest outside Asia. It once reached across the city, but today it’s not much more than a few blocks of Little Bourke Street. The Museum of Chinese Australian History, 22 Cohen Place, offers colourful guided tours of the museum and Chinatown for only $15. It’s rare to meet a museum guide with a catchphrase, but Annette Ripper, an animated Malay-Chinese lady, has one. She points to her official badge, which reads “A. Ripper”, and says, “It’s a ripper!” Often. Ripper leads me through displays on foot-binding, herbalism, cabinet-making and anti-Chinese racism, embellishing her pitch with curious trivia. Apparently there’s a farm in Tasmania that breeds seahorses for Chinese herbalists. Cantonese opera, which sounds like a cat impaled on a roundabout, plays in the background of a touching exhibition about the tough lives of Chinese miners in the Victorian goldfields. The miners entertained themselves with opium and gambling, and operas staged by Cantonese performers who came to Australia specifically to play for them. The whites thought the Chinese were homosexual because the singers dressed up as women. They were the first Priscillas, queens of the desert, but nobody has yet thought to make a useless movie about them. “I told him he has rocks in his head,” she says. The centrepieces of the museum’s collection are two gigantic dragons, built to dance in the streets on Chinese New Year. There is the biggest dragon in the world, and the oldest dragon in the world. (The longest dragon in the world, curiously, is in the Chinese Museum in Bendigo.) The traditional dragon has the head of a camel, eyes of a rabbit, horns of deer, legs of a snake, body of a frog, palm of a tiger and claw of a hawk, yet contrives to look strangely like Pauline Hanson. As well as good luck, the dragons are supposed to bring rain – and they’ve certainly done a ripper job in Melbourne. Like A. Ripper, Mao Zedong, who steered China to Communism, had a catchphrase: “Serve The People.” At the Post-Mao Cafe, 113 Little Bourke Street, the management seems to think this refers to food. The Post-Mao claims to offer all the Great Helmsman’s favourite recipes, but was Mao really known for his cookery? A little further down the street, the Post-Deng Cafe at 214 Little Bourke Street offers diners the chance to savour China’s former Paramount Leader Deng Xiaoping’s supposedly preferred Sichuan dishes. The restaurants share the same management. But didn’t Mao purge Deng in 1966, for his treacherous opposition to the Great Leap Forward? Didn’t Deng imprison Mao’s widow in 1976, for her counter-revolutionary support of the Cultural Revolution? How can they be united in the same catering chain? “I think they’re friends down there,” says an elderly waiter at the Post-Deng, pointing to hell. The only references to food in biographies of Mao and Deng appear under the sections on famine. The madness of Mao’s Cultural Revolution forced starving peasants to eat each other. Perhaps authentic Maoist eating habits will catch on, and cannibalism will be next year’s truffle oil. Happily, however, the great days of Chinese dictators are over. Who could even name today’s Paramount Leader, let alone his nickname or his catchphrase? And he probably eats at McDonald’s. At the airport, I have to remove my laptop from its case and slide it separately through the X-ray machine, in case I’m in the pay of Osama bin Laden and planning to destroy the Crusader Enemies of Islam using Microsoft Word. I shuffle though the security arch, to be taken aside by the guy who runs a sensor over your body to check for traces of explosives. This always happens to me. He finds nothing. This always happens, too. I ask how often he gets positive results. “About two in five,” he replies, unconvincingly. What? Two in five air passengers are terrorists? No, he explains. Two in five have recently handled chemicals. “after September 11.” It’s a slippery slope from happy snapping outside a Cantonese restaurant to flying an airliner into the World Trade Centre, and I’m just grateful the authorities caught me in time. *Note: The Museum of Chinese History’s excellent, $15, two-hour Chinese Heritage Walks must be booked at least 24 hours in advance. Set aside another hour (and another $16) for an optional lunch or dinner banquet. Phone (03) 9662 2888.